Another post that’s better late than never. The past year was spent traveling, running, and exploring all of New York – sounds a lot like year #1 and #2, right? To be honest, there wasn’t too much change. I continued to work for an awesome company, expanded my friendships within November Project, and squeezed as much out of my free time as possible. As I mentioned on the 31st, I learned a little bit more about myself, appreciated my body thanks to the I Run This Body movement, and learned when to let go. This last bit was tough in the sense of FOMO and friendships, but I realized (through many discussions and Elite Daily articles) that we can’t do it all and there comes a time in our lives that makes us realize what and who is important. But here’s a look at what made my third year in New York City so wonderful and memorable. 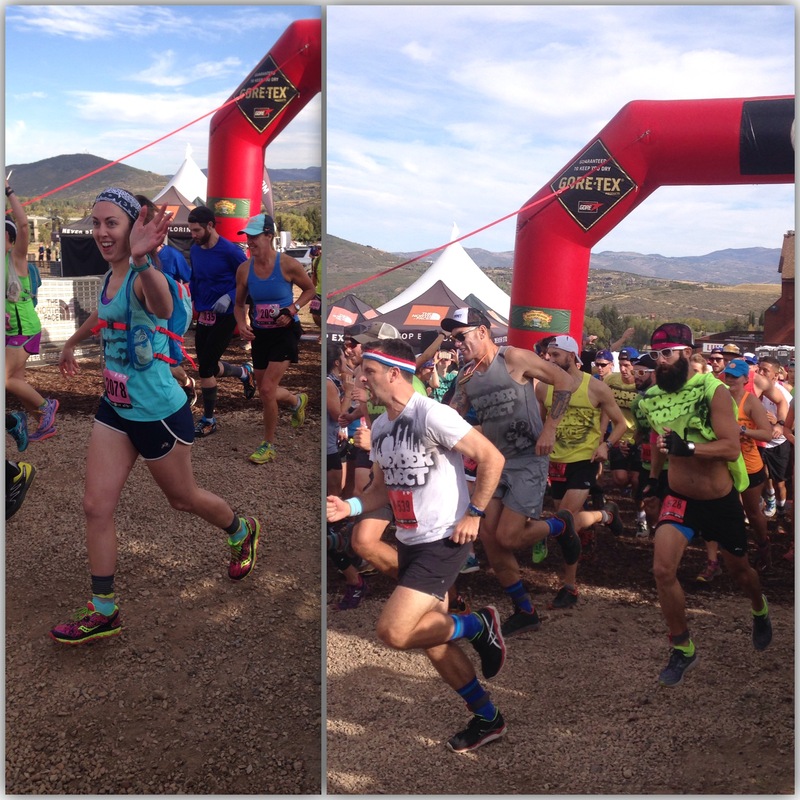 Warning: This post is packed to the brim with November Project fitness pictures from the recent North Face Endurance Race in Park City. If you just so happen to be friends with people who attended, I’m sure you are sick and tired of seeing pictures and throwbacks and flashbacks pop up on your feed. Well, if you are over it, I suggest you click out now. If not and you are oh so interested in the hoopla that went on, read on my friends, read on. About 10 of us NYC gals flew together out on Thursday night, narrowly missing the Papal chaos, and two girls just nearly missing the plane (story for another time), and then 5 of us crashing at a friends house in Salt Lake City. Early Friday morning, we reconvened with about 400 other November Project tribe members for a morning workout on the stairs of the city capitol. No really, there were TONS of people all.weekend.long. For pure evidence, check out NP Canada’s album here. ^^ This is Lily. She is one of my old/new friends from Los Angeles. She also blogs at “Lily Runs the World“. Boom. Sam and I. Sam and me. I am confused on the grammar of that sentence and have been battling my mother (the English teacher) about it. Anyways, Sam is my accountabilibuddy and we are two cool kids…as you can see. The best part about these events is that many of us have “met” through Instagram, Facebook, or some other strange way that our generation meets. Point of the story is many of us know one another through social media but haven’t met or haven’t seen one another in a long time. Summit = glorified summer camp. For three days. It’s amazing. 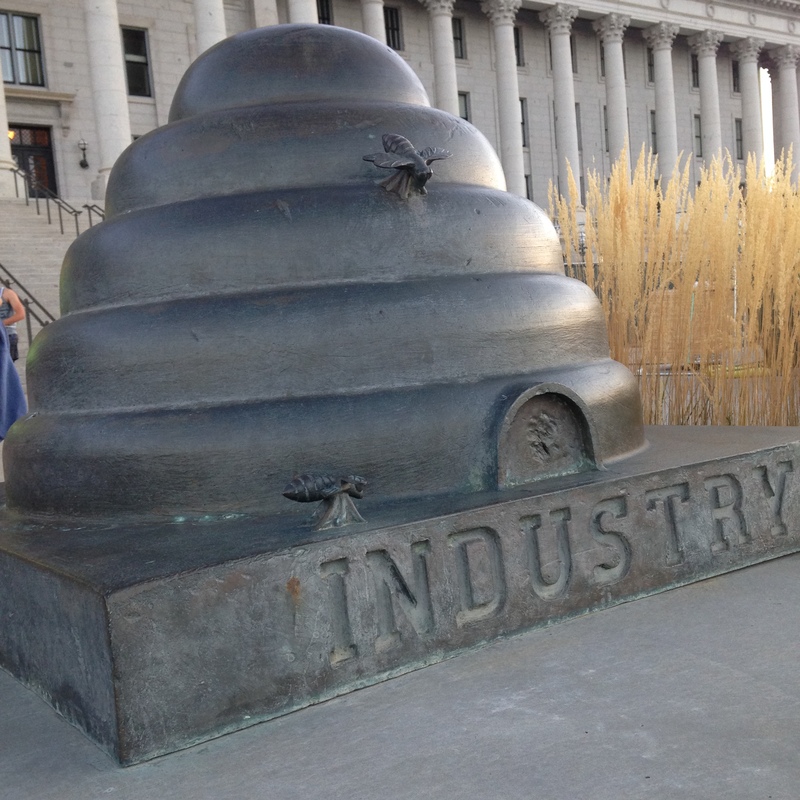 ^^ Utah’s state symbol, the beehive. Main reason being Brigham Young & the Latter-day Saints arrived in Salt Lake Valley, named it Deserret, which according to the Book of Mormon means “honeybee”. You can now see this symbol across Utah on signs and pretty much everywhere. ^^ THESE WERE $1 EACH. I REPEAT ONLY ONE DOLLAR! I swear, you would have thought we had won the jackpot. When I asked how much a homemade cinnamon roll cost, my jaw dropped and I proceeded to tell every single soul in the store. I may have walked outside with cinnamon roll in hand to spread the good news. I mean, this would have easily been $5 in New York. We all had decided to eat at this one store, which only happened to have one person working. I’m sure he was quite overwhelmed and while we ultimately all came waltzing into this poor store, purchased a treat, and walked out, it was worth it. After breakfast, it was back to SLC where we were staying, a quick shower, and then party bus to Park City! Just kidding. We were oh so chill and our friend Taylor drove us through the interstate and I laughed as my entire car was in awe of the mountains. Don’t get me wrong, it was gorgeous, but I had also been to Utah (and SLC/Park City) a fair number of times AND have practically grown up in the mountains, so it’s nothing new. Some of my friends had never been in altitude before! I couldn’t give them too much of a hard time because I must say things about the east coast that they think are no big deal. Point of the story is, listening to them oo and aw all weekend did remind me to stop and “smell the roses”. ^^ This is the Blue Haus crew. An AirBNB selection (best option ever) right off the main street and rolling deep with NP_NYC girls and Jonathan from NP_Boston (aka the Mother Tribe). Absolutely no fun was had during this trip. No pillow fights, no girl talk, no hot tub. 😉 We gave him a hard time. SATURDAY ~ AKA ~ RACE DAY! Saturday we were up bright and early (7:15? better than NP alarm clocks, which can be 4:50am or 5:30am), had breakfast on the porch, and maybe a little too much Keurig coffee. May not have been the best idea since I hadn’t drank coffee for two weeks. Between the caffeine and my nerves for running (always get nervous no matter what), my heart was literally pounding all.day.long. TAGGING TIME! 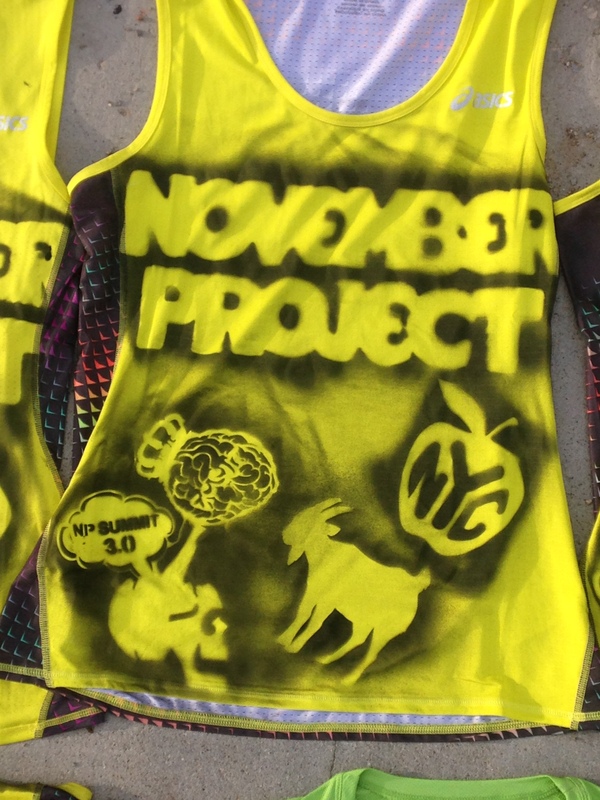 Because when you join November Project, you will learn that it’s completely normal to take all your workout clothes (and even purchase brand new items) to then spray paint them with various stencils. Technically we should only have the November Project tag and our respective tribes, but there was the Summit tag and we Mountain Goats need our own representation. ^^ Love love love this. We here are the Manhattan Mountain Goats, reporting for duty. As Burke put it, what happens when you put a Californian, a Lawyer, a Fashion Designer, and a Consultant together? One epic team. 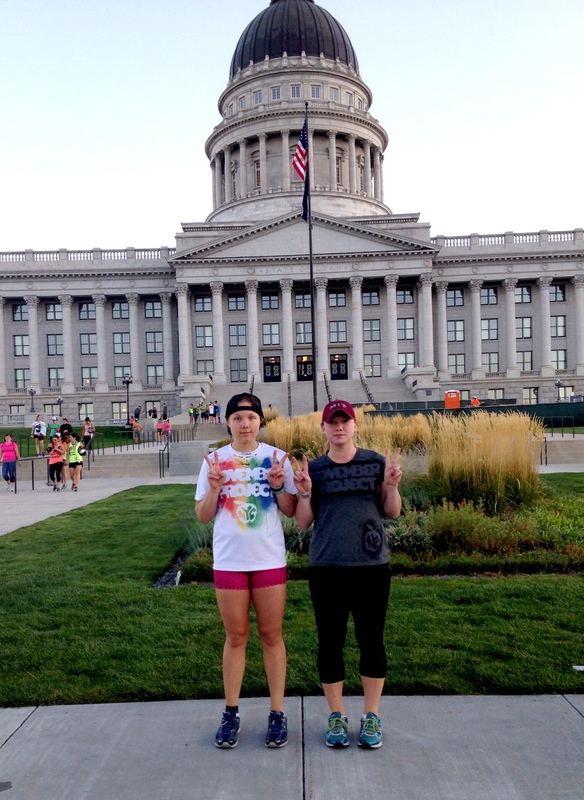 (LEFT) Here’s Laura, heading off at 9am for her FIRST marathon. That girl is crazy. 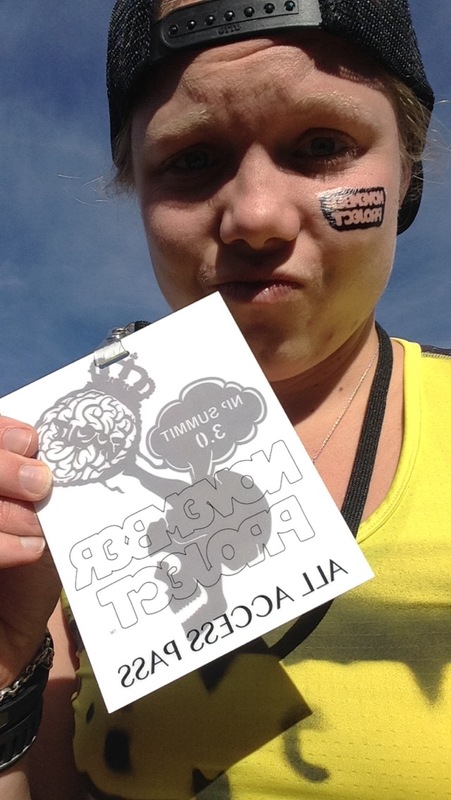 She decided to make a marathon – a trail marathon in altitude – her first marathon. She killed it. So proud. (RIGHT) Around 10am, we had the first legs of the marathon relay head out. Nice NYC representation above by Coach John and the awesome Matt Powers. Some of the leaders were handing out these nifty passes to people they didn’t know. It was like a little tribal stick where you had to then go find someone YOU didn’t know and hand the pass off. One guy made fun of me for holding onto it for too long, but really I had forgotten it was there. Also, I sometimes get nervous going up to random people. Sometimes. Strange, I know. We took pictures, we modeled, we cheered each other on. I waited around from 8:30 until 1:30ish when I ran the 4th and final leg of our relay. 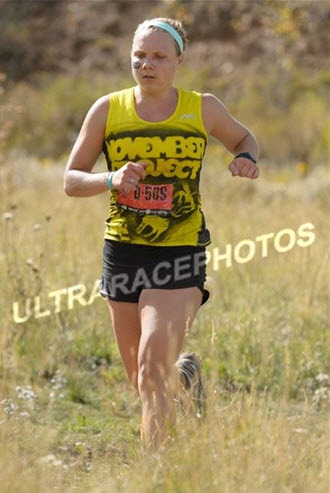 Times ranged around an hour (1:04:52 ~ 1:09:12 ~ 1:18:03 ~ 58:49) as the course went 3 miles uphill and 3 miles downhill. Not going to lie, I was so nervous all day. I’m not sure why since racing is all done for fun and there’s never any pressure on the line (except the pressure I put on myself of course). Aren’t we attractive? This was taken seconds after I finished and practically collapsed into Sam. The rest of my team had been chilling (in the Sierra Nevada beer garden?) and I was struggling to stay standing. I had completely underestimated the hills and the altitude and was banking on my sea level Central Park training to get me through. Once I stretched out a bit, it was off to post-race festivities, which included chilling in the Sierra Nevada beer tent (yay for shade), cheering on other runners, stretching, showering, dinner, and celebrating at the No Fun bar with all of NP. We may have stuffed a good 100+ people in the 40 person capacity patio. 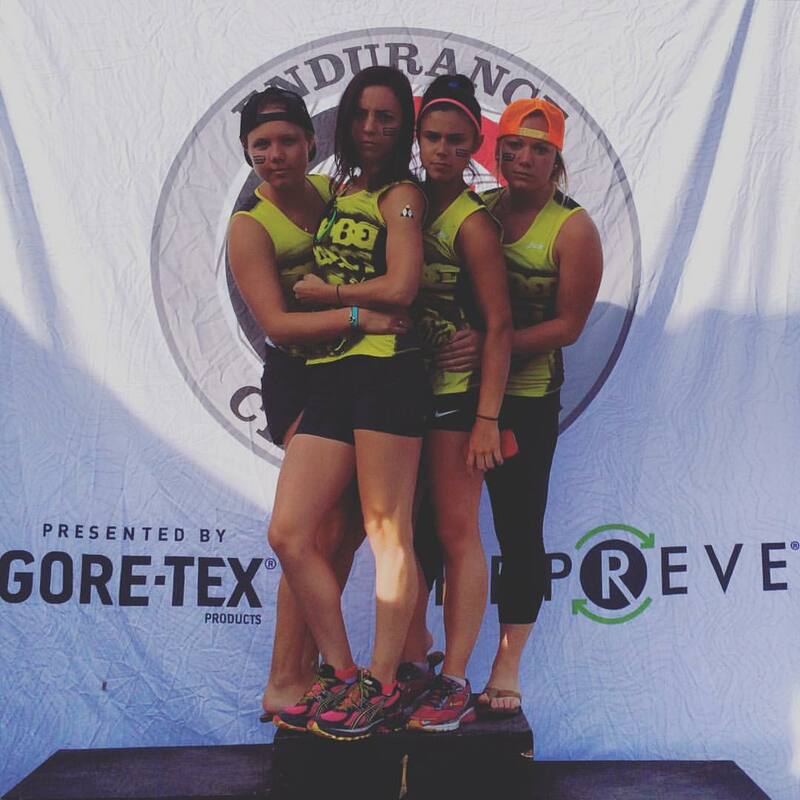 What happens in Park City, stays in Park City (on social media like this little blog). PSA: Drinking in the altitude is different than drinking at sea level. Just saying. ^^ Blue Haus crew making some joke that will stay in the orb of Instagram and not be repeated on the blog. Sunday morning spent with coffee on the porch, snacking on an energy bar, getting ready to do a little mountain shake out. I debated whether or not to run again, but I honestly couldn’t pass up spending some more time outdoors sans city grime. The crew above logged in about 5 or so miles, climbing and descending hills, wishing we had booked a few more days in Utah. As they jogged back to the NP_San Fran house for breakfast (homemade waffles because one dude packed his waffle iron…BRILLIANT), I got cleaned up, helped tidy the AirBnB and set off to find breakfast. It sure wasn’t a homemade waffle, but french toast croque monsieur, was quite divine. From there, it was time to finish cleaning the AirBnb, pack our bags, say goodbye to old and new friends (jealous of those who continued exploring the great Utah outdoors), and Uber our way to In N Out – $90 ride later and worth it. ^^ A trip to the west coast apparently isn’t complete without a trip to In ‘N Out. Can you believe that two people in my car had never tasted In ‘N Out? Mind blown. I actually wasn’t entirely in the mood to eat but I have FOMO (fear of missing out) and thus, purchasing a burger, fries, shake, and lemonade was the next logical move. But hey, points for the protein wrap, right? From there, we took an uber to the SLC airport, boarded a plane to Chicago, transferred and landed in Newark, caught a ride with Sam’s mom (mega thanks for picking us up at midnight) and crashed into bed. The next few days were not nearly as fun (think waking up and feeling hungover but actually having the flu…yeah no fun) but the memories remain, even if it’s all on social media. 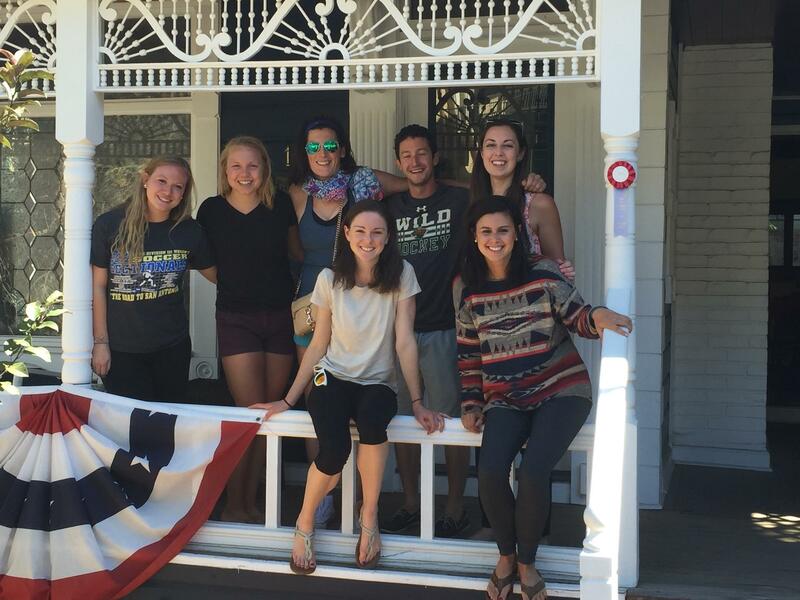 Yes this Blend Retreat recap is probably a week late but better late than never. Plus I had to break it up from the other lovely blogger’s recaps. Wouldn’t want to step on everyone’s toes now or overwhelm the readers. That’s right, always thinking about y’all. Isn’t it great when you enter an event not knowing a soul and leaving with some honest to goodness best friends? I went into the weekend with open expectations, just hoping to meet some great people and be outdoors. What I received was so much more. I’m not just talking about the endless supply of goodies from Arctic Zero to Quest Bars, but possibly lasting friendships, raw and real conversations, and so much more. Where would I even begin on this trip? Well, let’s just say that I’m still riding the high over a week later. Sure it’s back to work and the grind of city life but reliving those memories of the outdoors and blogger bliss helps keep me sane. I’m not so impressed by the 12 hours it took to arrive home on Sunday and lovely humid and rainy weather I was greeted with in the city but that’s another battle. I have a feeling this summer will be the true test of my strength on the east coast. If you didn’t catch on, I’m recapping my trip to Park City Utah for the Blend 2014 Retreat. Now many people are unaware of the term “blend” just as I was unaware of the term “hangry” for a while. No fear – it’s another way to say “Blogger Friends” and I personally think it has a better appeal than “hangry”. But anyways, this retreat was a way for bloggers – most of which fall into the healthy living category – to meet and connect. Some of us follow one another’s blogs and have connected online a number of times, but have never met in person. A few of my coworkers think this is odd but in today’s reality of online dating and technology in general, it couldn’t seem more normal. The adventure began Friday where I successfully took public transportation to JFK and arrived way too early for my flight. Three coffees and about 6 hours later, I was in Park City. Those who had actually planned ahead had arrived on time and were off on a group run led by the ever so sweet Janae (Hungry Runner Girl). I arrived just in time to indulge in a snack break hosted by Arctic Zero. After all, those travel days are quite exhausting, don’t you agree? There I had the chance to meet my roommate Megan (who was uhMAZING) and sip on a smoothie made with almond milk, Arctic Zero and some frozen fruit. I did feel a bit hipster with my mason-jar like mug, but that’s as hipster as I’ll ever be. We scooped up a few extra mugs and were on our way. The swag bags for this trip were beyond belief fantastic. But really. The sheer amount and quality of goods practically paid for the trip and will definitely help my future grocery bills. I can’t even begin to list out all the goodies we received but just know, I’ll be pumping out some posts with my favorites. The whole trip really did seem like a summer camp. We had a schedule with boot camp on Saturday and Sunday mornings, both of which were oodles of fun. I love working out in the morning and well just love working out in general. We had sets of push-ups and burpees and even some sprints. What’s funny is I completely forgot about the altitude and was wondering why it was such a struggle. Oh, working out in the mountains is not the same as sea-level-ish Manhattan…blonde moment. Following our workouts, we were treated to buffet breakfasts – day #1 sponsored by Quest and day #2 sponsored by Yoplait. Picture with my new blend Ashley ❤ Also, there’s something homey about drinking coffee out of a mug. I HIGHLY recommend the coconut yogurt by Yoplait. It may have a bit more sugar than a plain Greek variety but I’ve never tasted a flavor more pure and even enjoy the flakes of coconut stirred in the middle. I do however have a love/hate relationship with buffets. This is because while there are a ton of different options to choose from, I feel obligated to take a bit of it all. This usually leaves me a bit full and sleepy but no fear because a hike was near! That’s right, on Saturday we took the gondola up the mountain and proceeded to hike around some of the ski trails. While it wasn’t like the trails I was used to at Mammoth Lakes, it sure was nice to be out in the fresh air. My roommate and I attempted the long route back home and may or may not have just created our own trail down the hill. Definitely wouldn’t have passed the scout test there. What was truly nice about this retreat is that it enabled the bloggers to hang out, explore the outdoors, and get to know each other. We didn’t have any seminars and there wasn’t a strict schedule. We simply were allowed to explore, chat, and get to know one another as well as the beautiful area around us. A stop into town with my gals is of course a must. As is a picture with Mr. Moose. What can I say, I make friends with all the animals, real or not-so-real. It was also refreshing to talk to everyone about food, fitness, body image and more. Really it seemed as though we had been best friends forever. In fact, I had more heart-to-hearts with these gals than I did with some of my college friends. I guess it comes with the territory of blogging – you are practically putting your life out there for the world to see and read. We ended the weekend with a giveaway, one prize for every blogger. I swear it was like Christmas morning or winning a mini-lottery. This girl came home with a “six month supply” of Organic Valley coupons. Who knows if this will really last me six months but I’m game to try. It’s safe to say I won’t have to make too many grocery stops in the future. That or I’ll be able to bake some more goodies for my co-workers. Either way, it’s an epic success. Sending oodles of love and good vibes to you @panda_madre on your special day 💙🐼🤗 Here’s to many more fun times! © Kaitlin Fuelling and California Endless Summer, 2016. Unauthorized use and/or duplication of this material without express and written permission from this site’s author and/or owner is strictly prohibited. 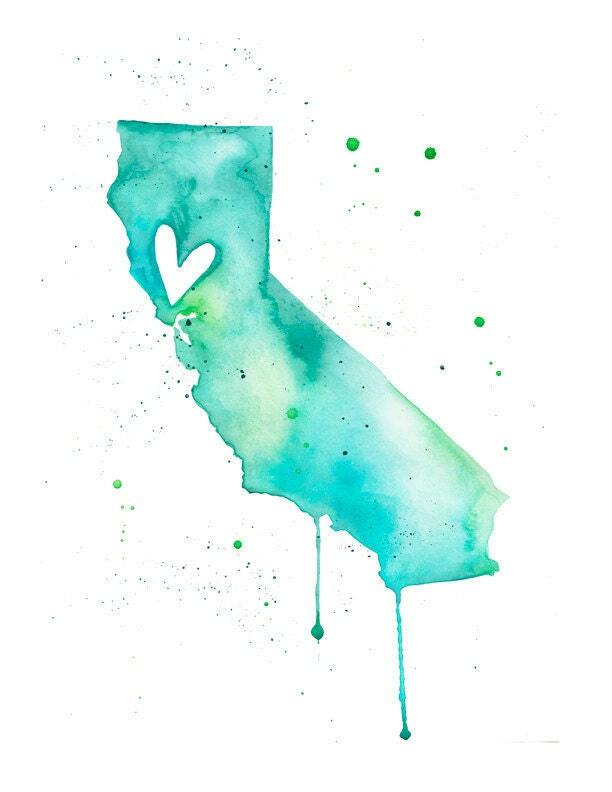 Excerpts and links may be used, provided that full and clear credit is given to Kaitlin Fuelling and California Endless Summer with appropriate and specific direction to the original content.